Figure 2: A range correlation provides groups. Figure 3: An azimuth correlation provides plots. More modern plot processors generally employ a more sophisticated correlation process than the simple sliding window. One possible method is the retrieving of the centre of mass correlation. 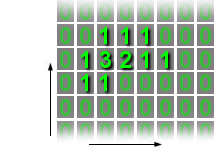 The correlator first assembles the hit pattern including azimuth over a prescribed area of range azimuth cells.  These are then grouped in range and then in azimuth. 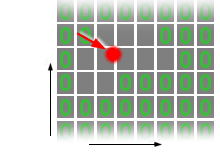 The plot position is computed by algorithms, which determine the centre of mass of the signal processor output. This method makes better use of the signal information and provides more accurate positional declarations.